Simple Healthy Guacamole is an incredibly fresh and flavorful Mexican dip. Authentically made with chunky avocados and tomatoes. Perfectly spiced with cilantro, jalapeño and garlic. 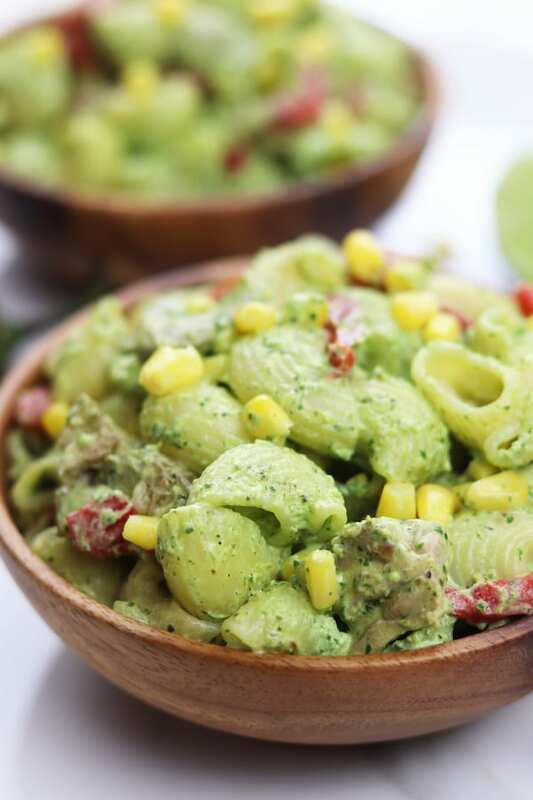 This recipe will spoil you for all other guacamoles. There are certain fruits and veggies that we always have on hand at our house and avocados are definitely one of them. We eat them in salads and sandwiches, on top of eggs and sometimes just by themselves. We absolutely love avocados not only for the creamy, nutty taste but also the health benefits. The only dilemma, when you buy a bag of avocados and they all ripen at the same time. This was the challenge I faced when I recently bought a bag from Costco and I had several very large and very ripe avocados. 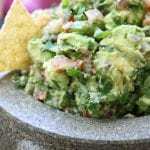 Much to my husband’s delight, it was time to make this Simple Healthy Guacamole. Paul absolutely loves this Simple Healthy Guacamole and I love his little-boy like reaction when I tell him I am going to make it. One of the many blessings of marriage is when something so simple makes your loved one’s face light up. In addition to having a very happy husband, I love the incredibly fresh ingredients. 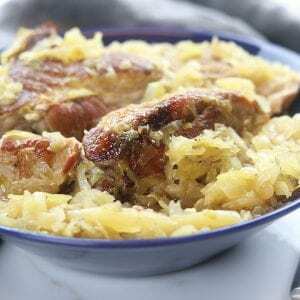 It is what sets this recipe apart from the rest. First fast and easy step in prepping avocados for Simple Healthy Guacamole. Second fast and easy step in prepping avocados for Simple Healthy Guacamole. Roasting jalapeño adds a hint of smoky flavor and mellows the heat. Beautiful colors of freshly chopped veggies. 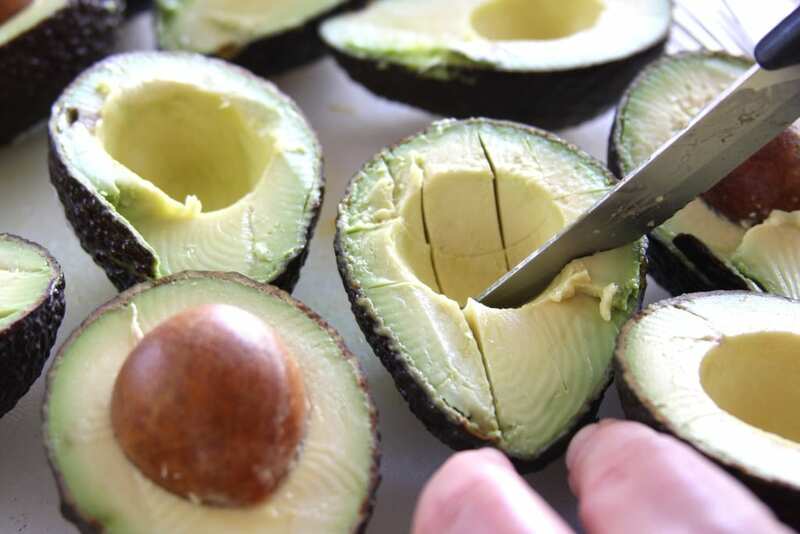 Cutting the avocados in half, into squares and then scooping with a spoon, is an incredibly easy and fast way to prep the avocados. 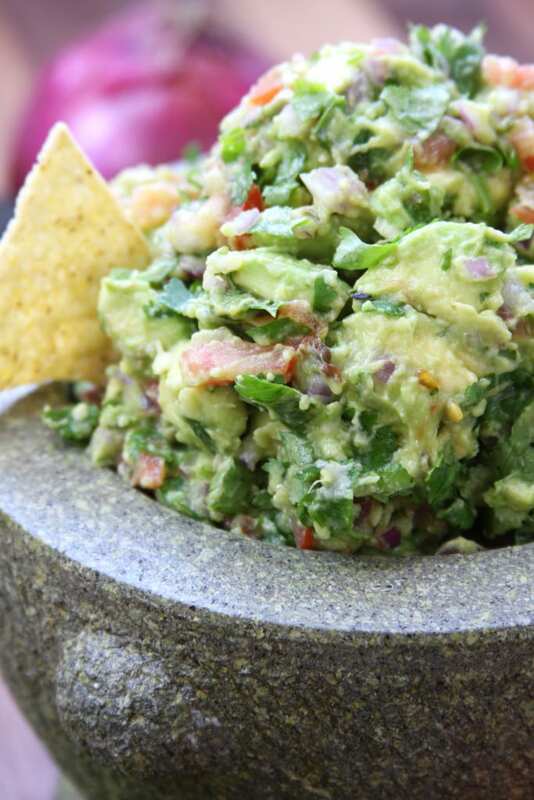 Do a little dicing, roast a jalapeño and this wonderfully fresh and flavorful Simple Healthy Guacamole comes together. 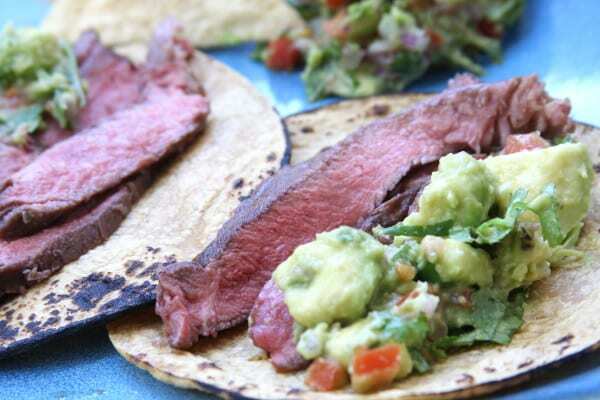 We had ours along side carne asada tacos from my post, How to Make Grass-Fed Carne Asada. The best way to tell if an avocado is ripe is by the bright green color of the flesh when removing the stem. If it is a dull green, the avocado is over ripe. If the stem is difficult to remove it is under ripe. Also, if the avocado gives slightly when gently squeezed it is ripe it is definitely ripe and needs to be used as soon as possible. Generally guacamole is best eaten immediately but sometimes needs to be made ahead of time and then stored. There are a few methods that can help prevent it from turning brown but this is the best method I have found. 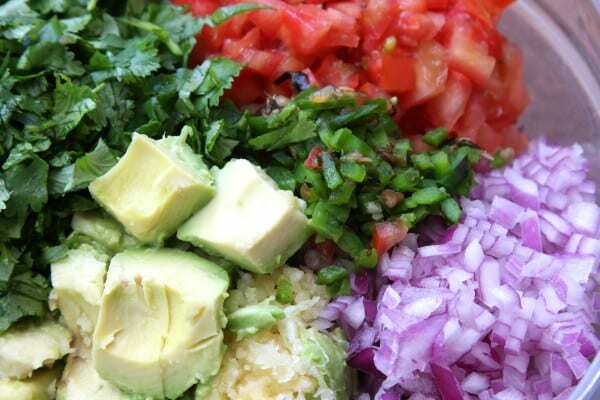 Make the guacamole according to the recipe, place in a glass or plastic bowl and smooth out evenly. 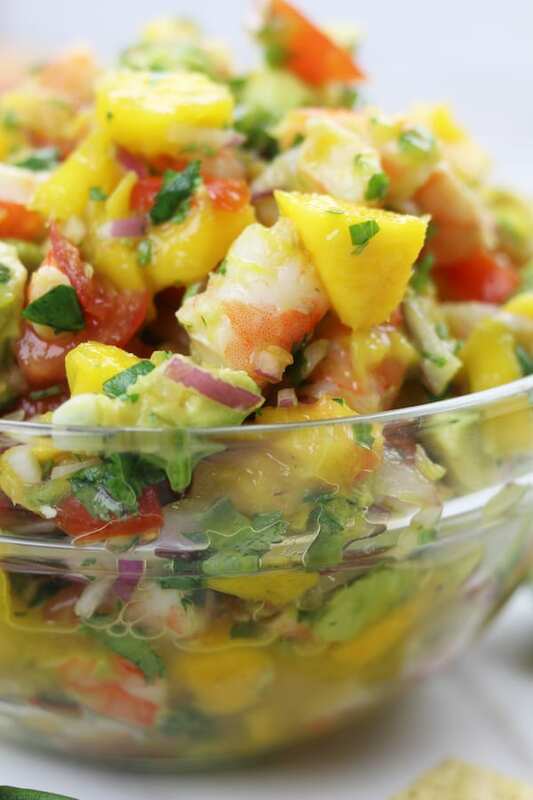 Place a small layer of lime juice (water may also be substituted in a pinch) over the top but do not mix it in. Cover and refrigerate. When ready to serve drain off excess liquid and stir. I prefer this method over placing plastic wrap directly onto the guacamole but essentially both do the same thing, keep the air out thereby preventing the avocado from oxidizing. Homemade guacamole will last no longer than two days. We generally make larger batches and admittedly it doesn’t last very long in our house but there have been a few times it made it past the 3 day marker. By day 3 and 4 what you will find is the veggies have lost quite a bit of their moisture, it will have turned a darker shade of brown and smell almost as if it is starting to ferment. By then it is time to toss it out. ***Pro Tips- If the avocados are extra large you will only need 4-5. We love garlic so I always use 3 large cloves but you will need to adjust according to taste preferences. I also use about 1- 1/2 tsp sea salt or pink himalayan salt and about 1/4 tsp black pepper. For kid-friendly version remove jalapeño seeds. 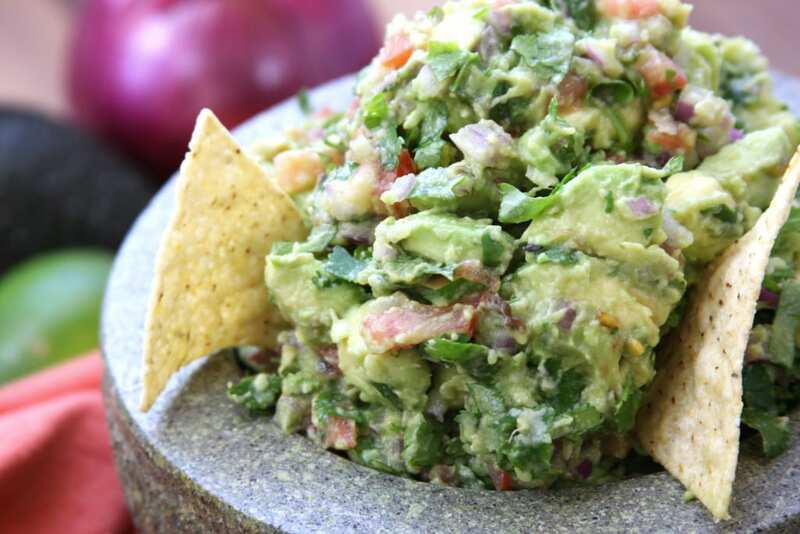 Fresh, flavorful and chunky authentically made guacamole. Cut Avocados in half and remove seed. With a small knife, cut squares in flesh of avocado, making sure to not cut through skins. 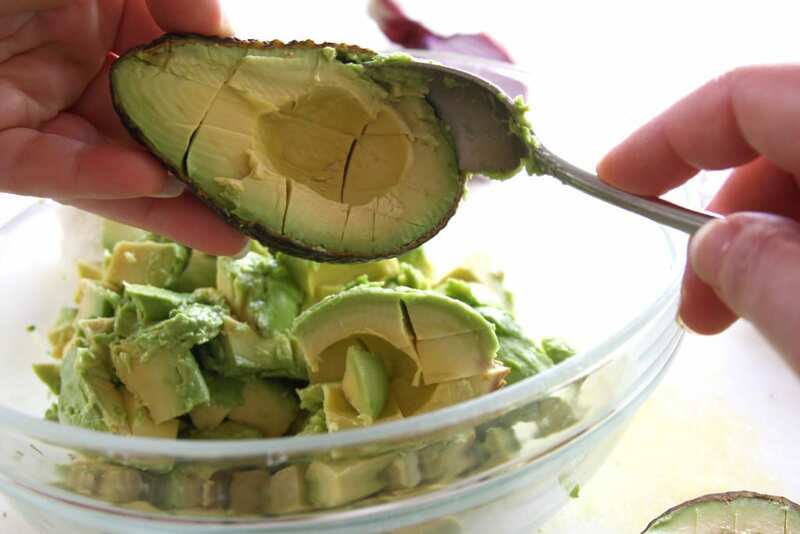 With a soup spoon, remove squares into a mixing bowl by scraping with edge of spoon between skin and avocado flesh. Squeeze lime juice over avocado squares. 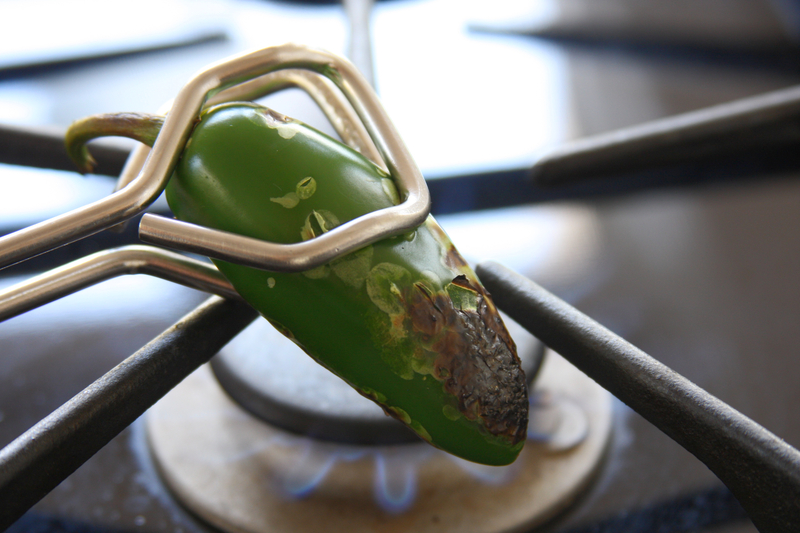 Roasting jalapeno is an optional step but adds a wonderful smoky taste and mellows the heat a bit. To roast, place jalapeño over open flame using tongs and turning once skin begins to darken and pop, roasting all sides. Dice and add to avocado. Cut and dice remaining ingredients, add to avocado. Stir to incorporate veggies well. Serve with chips or along side any Mexican meal. I’ve never met a guacamole I haven’t loved! I understand! I love guacamole too! ???? I have, yet to taste a guacamole dip that is not absolutely delicious. This recipe is great. How far in advance can I make this??? I would say no more than a day ahead of time. It really is best the day of but if you do decide to make ahead of time, smooth the guacamole out in its storage container and place a small layer of lime juice over the top. Don’t mix it in but rather refrigerate it with the juice layer on top and then discard the day you serve (you can also mix it into the guacamole if it doesn’t make it too watery). This will keep the guacamole from turning brown. I need to make this! Guacamole is one of my favorite things to have for lunch! I love that you roasted the jalepenos first! I know this tastes amazing! Thank you Alyssa! I really like the taste of roasted jalapeño. It just adds an extra little kick. How do you roast a jalapeño pepper if you don’t have a gas stove? Hi Susie, I apologize I didn’t respond right away. Just settling back in from traveling. One of best friends using a pan over high heat to roast hers. She doesn’t use oil, just the pan, jalapeño and high heat. Also you can roast in the oven in a cast iron pan (or closest type of pan you have) at a very high heat. I shared a live video of Marcela Vallavoid on May 4th on my Facebook page making fresh salsa by roasting the ingredients that may be helpful also. Be careful though, after watching the live video you may want to make that one too. ???? I have never tried making my own guacamole before but this looked easy and yummy. 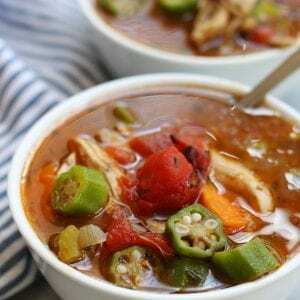 I am also a bit of a wuss when it comes to heat so I left out the jalapenos, though I’m sure that’s what most people will love about this recipe. I can’t stress enough how important it is to use PLENTY of lime juice, as this will keep the avocados from browning and add amazing flavor. I love the flavor so much that I put the tortilla chips in a bowl and sprinkled lime all over them before serving (too much will make them soggy so don’t go overboard HAHA). 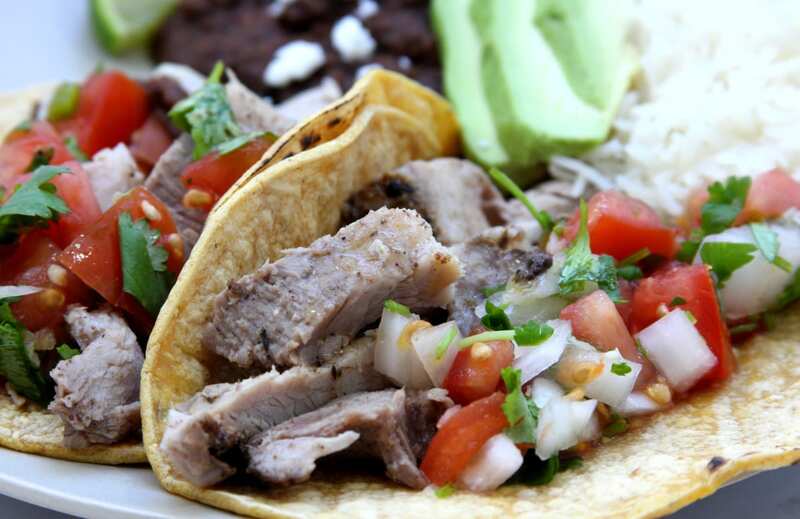 I really loved this recipe, sans jalapeno. Thank you! I love lime too! 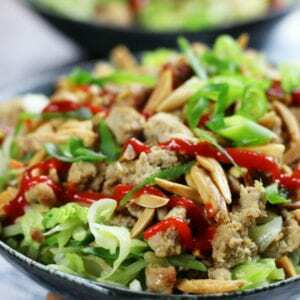 The beauty of this recipe is that you can absolutely customize it to your taste preferences (lots of lime ????). I hope you enjoy!! This looks amazing! That jalapeno ???????? Pinned and am totally making this! Thank you Heather! You made my day!!! ???? Made it! I didn’t have any cilantro (I thought I did but found out I did not and was too lazy to run to the store). I also didn’t have a fresh jalapeno pepper so used jarred. And I cut the recipe to 1/4 except I used the full onion. It turned out wonderfully and this is the first time I ever made guac. I will make it again – thanks!! I love that you will making making guacamole again after not making it before. That just makes me so happy!!! Thank you for letting me know. The email system may have been down for a bit. I just tested it and it looks like it is running smoothly again. If you don’t mind trying again but please don’t hesitate to let me know if it gives you any issues. Thank you for signing up! ???? 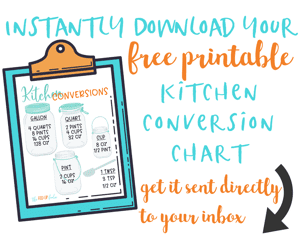 How many cups does this recipe make? I’m planning on making this for the 4th. 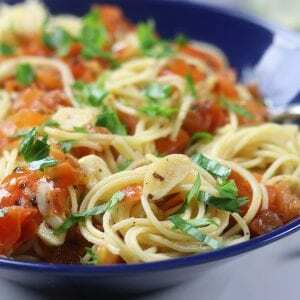 This looks amazing and easy to make. Thanks for the recipe. I have actually never measured the total cups before. We usually start to devour it before I can even measure. I hesitated to write how many it served also because that will be debatable on how much people love guacamole. I would say it is safe to say this will serve 8 people in a buffet style setting. I hope this helps. We put one of the seeds back in the guac, cover the bowl & put in frig when we’re preparing it for supper to keep it from turning. Just take the seed out before serving. ???? Always a great trick! Thank you for sharing! ???? That is such a great question. I have noticed that grocery stores all have different sized bunches of cilantro so I wrote the recipe using the large bunch equivalent (or 2 small bunches). 1 large bunch of cilantro chopped is about 1 cup packed. Cilantro lovers love this but those that hate cilantro struggle with the amount. You will want to adjust accordingly. ???? 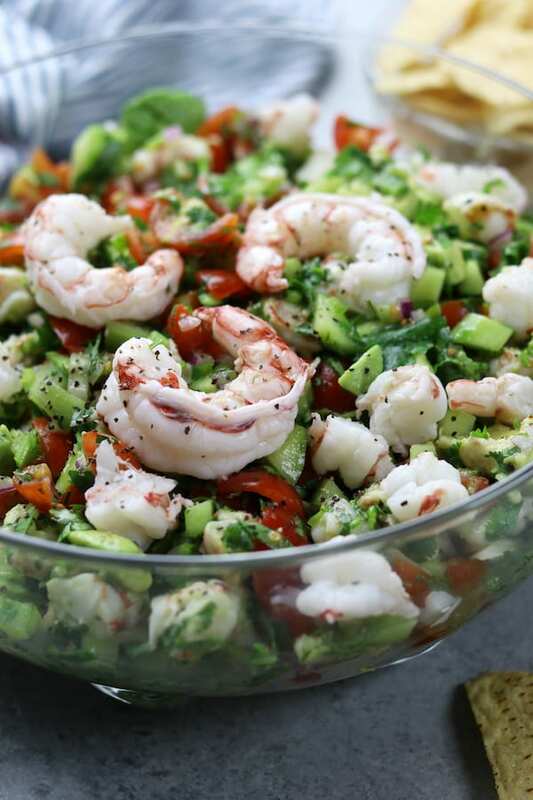 Heather This is cool, I love avocado recipes… can’t wait to try. Thanks for sharing. You just made my day Sandip!!! I hope you enjoy!!??? ?